The news on the climate front is not all bad- which, given trends since the turning of the decade, is about as good as it gets. According to the U.S. Climate Extremes Index, 2012 trailed 1998 as the year with the most extreme weather, as measured in financial loss. And as of late November, the average global land and sea temperature was expected by the UK's Met Office to be no higher than the 14th warmest year, or no cooler than the 4th warmest year, on record. The World Meteorological Association was more specific with its projection of 2012 as merely the ninth warmest year on record, due to the presence of La Nina in the winter and later in autumn. 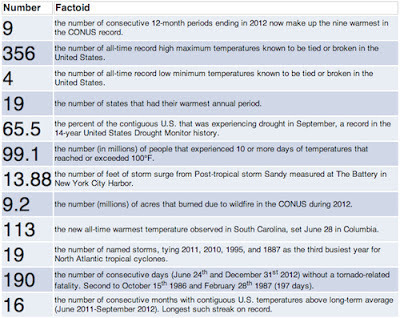 Nevertheless, average temperature in 2012 was warmer than in any previous La Nina year. The high temperature averaged over Australia was 105°F (40.3°C), eclipsing the previous record of 104°F (40.2°C) set on 21 December 1972. Never before in 103 years of record keeping has a heat wave this intense, wide-spread, and long-lasting affected Australia. The nation's average high temperature exceeded 102°F (39°C) for five consecutive days January 2 - 6, 2013--the first time that has happened since record keeping began in 1910. Monday's temperatures extended that string by another day, to six. To put this remarkable streak in perspective, the previous record of four consecutive days with a national average high temperature in excess of 102°F (39°C) has occurred once only (1973), and only two other years have had three such days in a row--1972 and 2002. 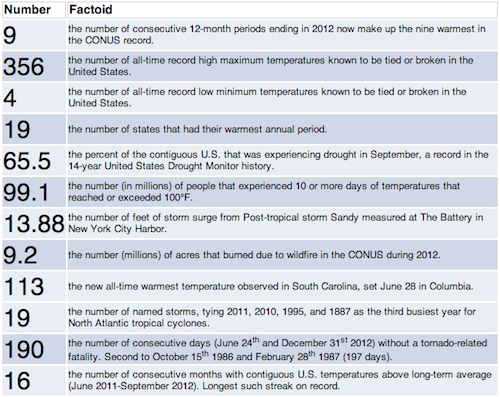 The difference between the record coldest year and previous record warmest year was four degrees. So there’s 117 years of data that were encompassed by four degrees of an average temperature, and now the 2012 value is one degree outside of that envelope. So we’re taking quite a large step above what the period of record has shown for the contiguous U.S. Bonus statistic (and others, from NOAA via Think Progress, below): November 2012 was, according to NOAA, the 333rd consecutive month with global temperature higher than the long-term average. The last month with a temperature below the long-term average was February, 1985. Only a coincidence, no doubt.